Consider your average white-collar professional making $45,000/year, not including benefits. At that rate, it would cost an organization about $25 for this person to sit in an hour-long meeting. That’s not too bad. But now consider that the average American spends nine (9) hours per week in regular status meetings, or preparing for those meetings. At the rate of $25/hour, the weekly cost of those meetings for one employee is $225. And when you look over the course of a year, it adds up to $11,700. All of a sudden, a cost that seemed relatively nominal has turned into more than a quarter of this professional’s annual salary. Three junior employees with an average salary of $40,000. Given that group, your weekly staff meeting costs the organization $380 a week, or almost $20,000 over the course of a year. That’s for one weekly meeting. Can you show a return on investment for a $20,000 per year for a weekly departmental meeting? Would you consider a budget line item for $20,000 that you could not justify? 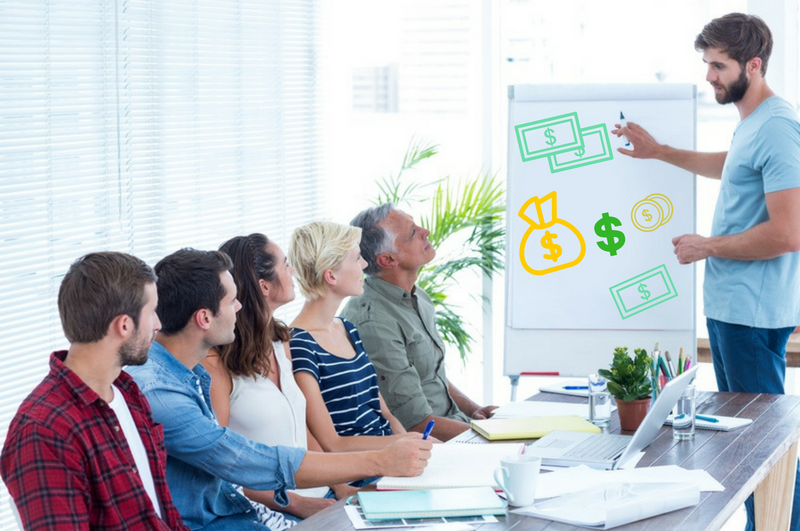 It’s not acceptable for other forms of organizational expenditures, and meetings should be no exception. The decrease in morale, especially if employees consistently leave meetings with a feeling of “why did they waste my time with that?” Decreased morale leads to decreased productivity. And if the meeting starts late (which, of course, never happens), the organization is paying for a group to sit around a table for 5-10 minutes until everyone has arrived. In a recent survey of 2,000 professionals, 35 percent of respondents called meetings a waste of their time, and three out of five reported that they spent their time in meetings multi-tasking rather than participating. According to author and “meeting culture” expert Al Pittampalli, one of the biggest problems with meetings is that they are used as a way to diffuse responsibility for making tough calls – you get a group of people in a room to talk about making a decision rather than just making it. That way, if it goes south, it was a team call instead of an individual one. Meetings are not the enemy. Bad meetings are the enemy. The idea of a meeting – bringing people together to collaborate and communicate – is a good thing. However, when was the last time your organization provided training to people on how to run an effective meeting? It’s simply something that is not taught. Keep them short. Most meetings are scheduled for an hour by default. But do you really need an hour? Next time, try scheduling for 30 minutes and see how much you can get accomplished in a shorter time period. You instantly cut the cost of the meeting in half, and may accomplish just as much. Have a specific goal. Some people will tell you that you should have an agenda for every meeting, with a minute by minute count of the topics under discussion. I would argue that a meeting with an agenda is a meeting with too many goals. Instead, hold a shorter meeting that is more focused on achieving one specific point, and make sure that goal is communicated ahead of time to participants so that they can focus their preparation. Use other forms of collaboration to increase efficiency. If all you’re doing is coming to a meeting to deliver a status update, that’s something that could easily be done with a collaboration – project management tools like Basecamp, or even just a shared spreadsheet in a Google Doc that everyone goes in and updates. That leaves the rest of the meeting to focus on brainstorming, planning, or problem solving – things that are much better done in person.